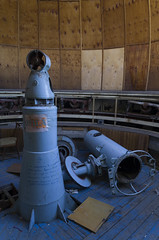 Inside abandoned Observatory of Pioneers Palace, 14.10.2014. Chisinau Observatory, the youth astronomy club. The dome. Focșani, Romania - Winter, București Blvd.